Introducing Bruker’s New High Resolution PeakForce Tapping Probes for any application, air and fluid! 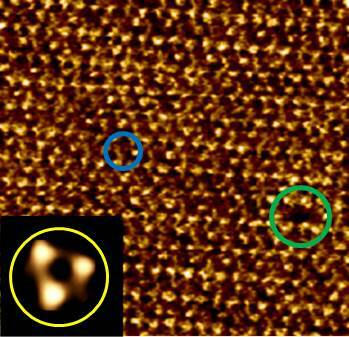 Delivers highest resolution on molecular lattices. Lattice structure of Bacteriorhodopsin (bR) taken on an inverted optical microscope with BioScope Resolve. Inset showing a single particle averaging of the bR trimer. Green circle showing a single lattice defect. Blue circle showing the lattice substructures. Z scale 0.6 nm. Delivers highest resolution on single biomolecules. Continuous imaging of the DNA double helix obtained while operating on an inverted optical microscope. 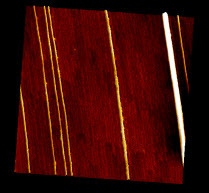 Both the major and minor grooves, 2.2 nm and 1.2 nm respectively, are clearly resolved over the entire DNA strand. 150 nm scan size. Movie playback speed 9x. Delivers highest resolution on delicate samples in air and fluid. 300 nm image showing carbon nanotubes to be aligned with the crystalline structure of a quartz substrate. Acquired on a Dimension Icon using PeakForce Tapping, with PEAKFORCE-HIRS-SSB probes. Delivers highest resolution for general imaging in air. 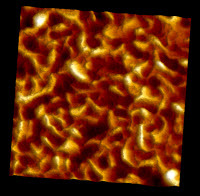 300 nm image resolving sharp ridges on a Nioprobe sample. Acquired on a Dimension Icon using PeakForce Tapping, with SCANASYST-AIR-HPI-SS probes. Delivers highest resolution for high speed imaging.